I present today another version of my Northern light - Aurora Borealis photos, shot from the upper deck of Hurtigruten - the coastal express, somewhere a bit south of Tromsø in Norway North. Some central exif info: F4 Shutter 8sec. ISO 1600. Manual focus. My lens is an Olympus 14-150mm mounted at my Lumix GX7 mirrorless camera. (35mm equal= 28-300mm). This a top lens for allround shooting but of course have the disadvantage in not being especially light sensitive (F4 is maximum aperture). Shooting in a pitch dark environment as a arctic night like this, calls for a lens with an opportunity to be more light sensible. Also the mix of ISO speed and shutter time is essential to have a better result than displayed here. Even in this smaller version from the original I find the ISO noise to be disturbing and also the lens ability to render more light i.e. from the landscape. Finally shooting with long shuttertime from a ship moving in app. 30km/hrs (some 17 nat. miles) is neither any optimal situation. Conclusion: Use your best lens -aperture wise-, use a wide angel lens, increase the shutter time and use lowest iso possible (under the excisting conditions) in this "mix" to have a better result. And use manual focus. 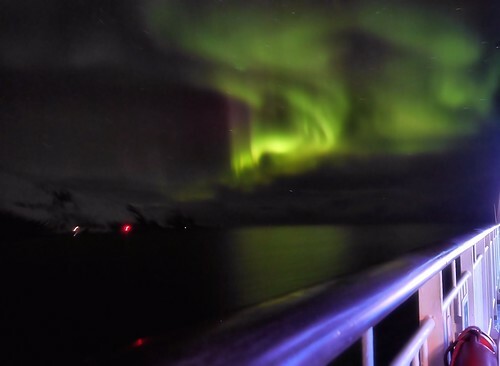 Good luck should you have the chance to photograph the Northern Light - Aurora Borealis.